Marcelo Coronel & Christopher Dorsey. Rosario, Argentina, 2008. 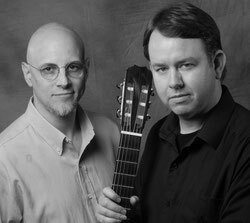 In the fall of 2006, Christopher Dorsey studied Argentinean folk music and interpretation with composer Marcelo Coronel in Rosario, Argentina. Chris commissioned Coronel to write the solo guitar work Música de los Andes and is also the work’s dedicatee.